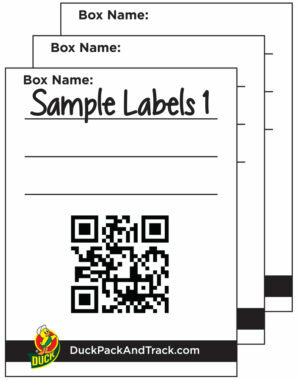 Ready to try out the new Duck Pack & Track™ labeling and storage system? First, download the Duck Pack & Track app to your smartphone (iOS or Android). Then, print the samples listed below, attach to a box and use your phone to start scanning. Reading this page on your phone? Once you have installed the Duck Pack & Track app, you will need to use your smartphone camera to scan the sample labels. So, either print out the labels ahead of time or use a different computer screen to display the labels for your phone’s camera.